- Type in your child's name or any word.The program automatically opens a new window and then fills the page. OR practice the Alphabet using single letters or wildcards. - Whether your child is writing a story with its own special picture, composing a poem or taking notes on a science experiment, it is always useful to have a stock of lined or decorative paper waiting! - Choose form a variety of themes and line types to create custom writing paper. - power up your printer and print the paper for yourself, for your students, and for your children. Browse the links in the blue sub-menu above or, while you are on this page, from the links listed below. - These downloads may be reproduced by individual teachers or parents for noncommercial use in their classroom or home. - Handwriting and creative writing printable materials to learn and practice writing for preschool, kindergarten and early elementary. 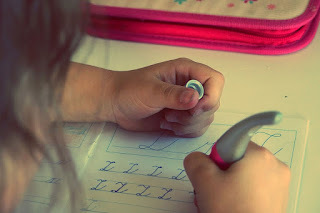 -- Students will practice tracing upper and lower case letters on the first worksheet and they will trace the names of shapes on worksheets 2-4. Each shape word is accompanied by a goofy dragon holding a shape. Similar to Zaner Bloser style font. -- Use these free, printable worksheets to learn letters, numbers, colors, shapes and other basic preschool skills. If your child can understand these activities, they are ready to use K5! -- Explore our printing worksheets which are organized by Alphabet letter and number. These worksheets are printable and can be used in the classroom or at home. Learning to print is essential to the overall development of a child. These printing worksheets are a lot of fun and a great way to teach kids how to print.